Over the past few months we have been approached by a number of teachers searching for resources to raise essential topics with boys and young men in their schools. In response to this demand, we have added a submission form to our website so that teachers and educational leaders may put our resources to use without delay! We are resolute in our mission to share the Being ManKind stories and positive messages far and wide so we jumped at the chance to extend our reach even further through Head First. They provide essential support to schools to improve the emotional health and resilience of pupils, and our resources now sit proudly on their online portal, freely accessible for teachers in their network. This week, International Men’s Day was commemorated by charities, organisations and schools across the UK. In particular, The Perse School in Cambridge ran a campaign championed by teacher Lilly Freeman. 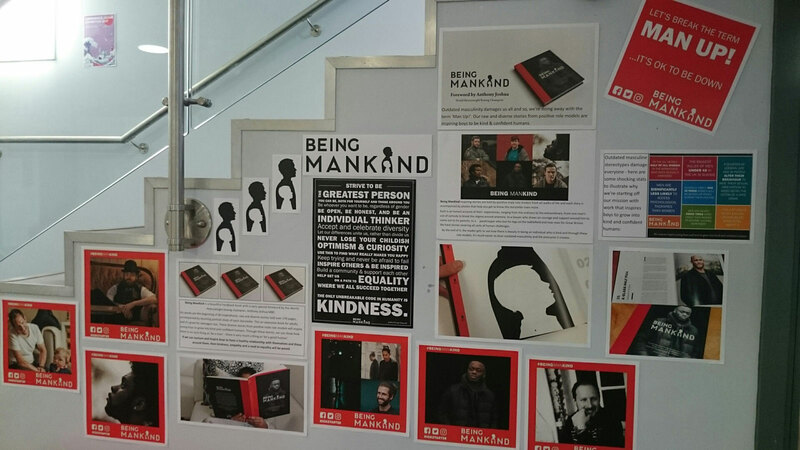 The wonderful Being ManKind display shown in the photo was masterminded by the school librarian, and this was coupled with the delivery of assemblies on Masculinity and Mental Health to Years 7 through 12. Each session began by playing the video of our spoken word piece, ‘Being ManKind’ performed by the talented Emmanuel Speaks. The assemblies were a resounding success and Perse School plans to continue these important conversations in PSHE classes centred around our resources. The feedback from Lily also triggered a bit of a lightbulb moment – we will be expanding our educational programme by adding ‘assembly plans’ for each resource in early 2018! The majority of our work in developing our educational programme takes place hidden behind a Macbook Pro screen, so Jenny and I relish the opportunity to test and refine our resources in different settings. We recently delivered a Parent-Teacher session, ‘Master of your own destiny’ at Limes College Pupil Referral Unit, and a ‘masculinity’ workshop to a group of inspiring fathers at the Young Dads Collective. The feedback we received from these groups is invaluable to develop our programme and using this, we have added a new standalone session to our collection, ‘The Art of Manliness ’to raise the topic of masculinity with 11+ year age groups. What’s apparent through these interactions is that people of all genders, backgrounds and ages are able to connect with and draw inspiration from the Being ManKind stories. We can’t wait to expand our collection of stories through the publication of volume 2 and share the positive messages far and wide. The list of schools benefiting from the stories and educational programme continues to grow and next year, we plan to develop videos and more to keep engaging and reaching young people. Last week, we were invited by Jenny Garrett from Rockin UR Teens to give a short interactive talk at an annual conference attended by teenage boys. On showing our spoken word piece, we invited the 13-14 year olds to think about a time when they have encountered a challenge or obstacle because of their gender. Naturally, we expected some resistance to speak up in a room filled with 150 teenage boys but we were amazed by their response. Three boys immediately stood up to relate their experiences of anxiety, depression and broken families. Once they started opening up with their stories, we saw another hand go up, then another and another. Eventually, we couldn’t stop the flow and were practically dragged off stage for running overtime! The narrative around mental health is slowly changing, and we want to be at the forefront helping to push the agenda to banish the stigma forever! Our ultimate plan is to share the powerful messages from the Being ManKind stories across the curriculum from PSHE to English, Drama, Art and Music. A few months ago, we were contacted by Hannah Azman, a drama teacher in Woolwich Polytechnic School who raised concerns about behavioural issues with young boys in her school. She shared our passion to explore the stories in a different school setting and we are proud to be working with Hannah to develop drama plans, which will be available from our website in 2018. In the words of Nelson Mandela, “Education is the most powerful weapon, which we can use to change the world”.